All Things Dog Blog All Things Dog Blog: ASK THE VET: Why is My Dog So Restless? ASK THE VET: Why is My Dog So Restless? My dog is a 9 year old Newfoundland who is showing his age but is healthy. I have had him checked by our veterinarian for an odd behavior and gotten no reason for it. Perhaps you will have an idea. Choppie (short for Porkchop) has gradually become more restless at times. He will pace from room to room, asking to go outside, then wanting to come back in, then back outside and so on. He does not cry or moan or scratch, and there are no signs of pain. I cannot figure out why he is so restless. This is not all the time, just sometimes for short periods. Any thoughts? Thank you. It is difficult to say for sure why the restlessness and pacing, but it could be a medical reason (infection, neurologic) or behavioral. It depends on his age and upon a physical exam. If you haven’t done so already, have your vet check him over really well and consider having bloodwork run on him. 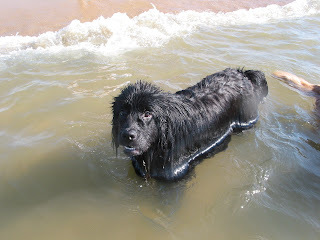 A Newfoundland becomes a senior much earlier than a small dog so it is important to run bloodwork yearly to help prevent any serious issues. Hope it works out to be nothing!! Thanks to Kim for sharing Granville as today's cover dog. Isn't he a beautiful Newfie?